"We have a mandate to help the unaffiliated connect to their Jewish heritage and welcome them and interfaith partners with a Jewish Universalist vision for the future," notes Blane. Sim Shalom Online Synagogue grants smicha to nine JSLI-trained Rabbis on July 1, 2018. 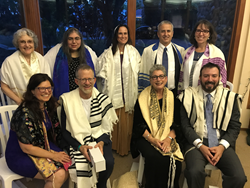 As part of a deeply spiritual ordination and shabbaton weekend in Stony Point, New York Rabbi Steve Blane and the Bet Din welcome new Rabbis from across the US and Canada to the family of Rabbis trained by the Jewish Spiritual Leaders' Institute. This new class hails from the DC area, Arizona, Massachusetts, New York, Florida, Minnesota, Texas and Nevada. JSLI is the only fully online rabbinic program for Jewish professionals. This newest 15th Class reflects the diversity and richness of the Jewish Spiritual Leaders' Institute and includes a law professor, pulpit Rabbi, and a CPA. JSLI provides opportunity to those like this dynamic group to fulfill lifelong dreams. The nine brought their wealth of life experience to the program and along with Rabbi Blane and other teachers explored contemporary topics facing the modern Jew - many of whom are unaffiliated and disconnected from Judaism. "We have a mandate to help the unaffiliated connect to their Jewish heritage and welcome them and interfaith partners with a Jewish Universalist vision for the future," notes Blane. "The new group of Rabbis are excited to fulfill this mandate and pursue their individual paths to creating Tikun Olam, "repairing the world." Additionally Rabbi Blane attended a follow up celebration for one of the new Rabbis in Great Barrington, MA and skyped into another celebration in Arizona this past week. The ability to connect virtually as well as in person has made JSLI a pioneer organization that meets our candidates and their congregants where we live in the modern world. Sim Shalom is an interactive online Jewish Universalist synagogue which is liberal in thought and traditional in liturgy. Created in 2009 by Rabbi Steven Blane on Manhattan's Upper West Side, Sim Shalom offers a means of connecting the unconnected. Rabbi Blane leads accessible and short Shabbat services every Friday night using a virtual interface and additionally Sim Shalom provides online education programs, Jazz concerts, conversion and life-cycle ceremonies along with weeknight services at 7:00PM EST led by Rabbis and students of this online community. http://www.jsli.net, the online professional rabbinical program and of the Union of Jewish Universalist Communities, an association of Rabbis and communities who support Jewish Universalism. Sim Shalom, a non profit 501 © (3) tax-exempt organization, nurtures a Jewish connection through its mission of innovative services, creative education and dynamic outreach to the global community. For more information visit http://www.simshalom.com or call 201-338-0165.